Elizabeth (Lizzie) has had a prominent presence at PYD for over three years. She participates in our theater arts and group mentoring programs, and has been matched with her mentor for over two years. In addition to these programs, Lizzie also participated in a leadership development fellowship last year at PYD. She began attending college after starting at PYD and recently earned a job. Read in depth about Lizzie’s success in her own words below. “I am a student at Massasoit Community College majoring in human services. In the fall of 2017, I was lucky to get a fellowship opportunity with PYD as part of their Transportation Advocacy Mentoring Initiative. My group partnered with a group from Michigan to discuss commonalities and differences in transportation access. We discussed challenges we all face using public transportation and identified recommendations for improvement. As advocates, our group sent a letter to the Massachusetts Bay Transportation Authority (MBTA) to ask for improvements and changes in the process of getting a Transportation Access Pass (TAP). A TAP pass is a discounted card for individuals with disabilities and seniors to encourage them to use the MBTA. We wanted to be able to apply for the TAP pass in places other than Downtown Crossing. We received a response back from the office of Rob Sampson whose title is the general manager of the MBTA’s System-Wide Accessibility department. We were excited to hear that management is implementing different options to obtain this pass. 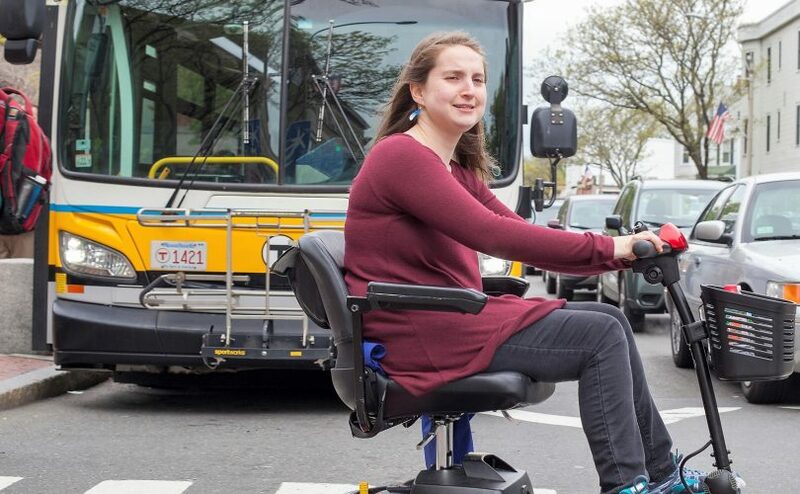 As an individual using a mobility device to get around, I know first hand how challenging public transportation can be. After the fellowship ended, I went to an interviewing and mentoring workshop run by PYD where we discussed the kinds of questions asked in an interview. We also role played by having an interviewee and an interviewer and asking each other questions that may be asked during an interview. This proved beneficial to me because I was invited to come into the MBTA for an informational interview at the State Transportation Building in Boston. It was so coincidental that Mr. Sampson who was the one that my group wrote the letter to during the transportation advocacy panel was at the informational interview. He told me he remembered the letter my group wrote to him, especially since they are actively working on changing the process of obtaining a TAP pass. After the interview I did a photo shoot and travel training for the MBTA. I continued to discuss an internship with them for the fall of 2018 which I need to graduate with a human services degree in the spring of 2019. I was fortunate enough to get the Internship with the System-Wide Accessibility Department at the MBTA. This insightful and smart article highlights some great work being done. And I’ll bet this is just the beginning of many important things this young lady accomplishes in her professional life. Kudos to both Lizzie and the MBTA. What an amazing story Lizzie! You are an asset to the transportation field. I hope your internship leads to a potential long-term career in transportation sectors! Sounds like very productive advocacy that got some great results!